Reach for the stars and together we will shine! A Pre-K to 5 school, servicing the families of Ridgewood, NY since 2003. The P.S. 239 cheerleading team participated in the 3rd annual cheer and dance competition at Grover Cleveland HS on March 9. We are so proud of the girls efforts in preparation for this wonderful event. Our cheerleading team received 4th place and showed excellent sportsmanship throughout the entire event. They cannot wait to compete again next year! Extra Special Thanks to our coaches Ms. Levy and Ms. Brugge and to all the parents and staff that helped support our team. PS 239’s Second Grade performed an amazing show celebrating the contributions of African-American artists and civil rights leaders to our culture. Watch a highlight video below. Video showing the second grade performance. PS 239’s Kindergarten worked so hard to put on a beautiful show about love for us. Watch some highlights below. PS 239’s Fourth Grade put on a wonderful performance to celebrate winter on this freezing January day. Watch some highlights here to warm you up. PS 239’s Third Grade shared a special performance, “They Fought For Our Freedom.” Watch some highlights here. 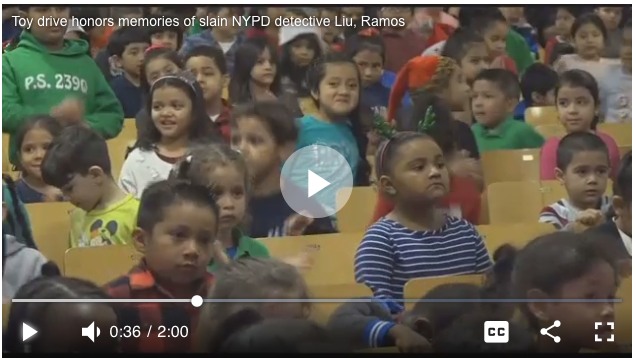 PS 239 was honored by the Detective Rafael Ramos Foundation to receive a wonderful holiday celebration and toy drive. Watch the video from News12 to see all the fun we had. Our Fourth and Fifth Grade put on an amazing performance of Charlie and the Chocolate Factory. Watch the entire play below in 4 acts. PS 239 special. Watch the video below to see some clips from our Parade of Nations. This video is about international night. It shows students in dress that represents their culture. Read about out project HERE.